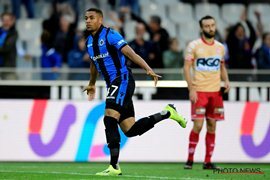 Club Brugge left winger Arnaut Danjuma says he is honoured to be named to the final 25-man Netherlands roster for their upcoming games against Germany and Belgium. The international future of the former PSV Eindhoven wonderkid has been the subject of speculation following his impressive performances for the Belgian First Division A club and that matter will be resolved once and for all if he gets some minutes against the Germans in a week's time. ''I was home and got the message on my phone, then I jumped with happiness, I think it's a reward for what I've shown, and now that I'm selected, I want to show what I can,'' Danjuma said in an interview with the TV Channel of Club Brugge. Atlético Madrid coach Diego Simeone spoke glowingly of the number 47 after he scored a brilliant goal against the Spanish side in the UEFA Champions League and the 39th minute strike was nominated for the Champions League Goal of the Week accolade. Barcelona midfielder Ivan Rakitic's stunning volley he scored against Tottenham Hotspur was chosen ahead of second-placed Danjuma, Juventus' Paulo Dybala and PSG superstar Neymar. The 21-year-old Danjuma has tallied 5 goals in 13 games across all competitions so far this season.